It all started with a drunken conversation amongst 8 of us in a hostel bar overlooking the magical Lake Atitlan, we’re not sure if it was the happy hour beers or the beautiful scenery that had gone to our heads but we agreed that we would all wake up the next morning, at the crack of dawn to go Lake Atitlan Hiking together. There were five of us that actually made it to meet at 6 in the morning which we were actually all quite surprised at. We all had snacks & water that we had purchased the day before so with sore heads we set off to tackle the Indian Nose, a hike that rated difficult but rumoured to have spectacular views of Lake Atitlan & its volcanoes. Starting in San Pedro, the village we were all staying in we took the road to the small village of San Juan La Laguna, it was a perfect morning temperature with the sun just having come up & a few people around just starting out their day. We all chatted away on the walk there about how we amazed we were that we’d actually all made it & once we arrived in the small village of San Juan La Laguna we stopped for a coffee to fuel us for the journey. From the village of San Juan we followed the road that ran right up the back of town & follow it straight up the mountain to reach the Indian Nose viewpoint. We had read that there were various access points where you had to pay a fee to get to the viewpoint but this was not one of them, we walked straight up past some local village kids who stopped for a laugh & a giggle at 5 tall, very pale foreigners smothering themselves in sun cream & after around 10 minutes we reached the start of the trail. As usual we used the app MAPS.ME to navigate so we were sure that we were on the right track, we had heard some horror stories beforehand about machete yielding farmers approaching tourists so we wanted to ensure that we didn’t just wander in to the middle of someone’s field. Passing a couple of these farmers shortly after who had nothing but smiles & waves for us relaxed us all a little, it was so nice to get away from the backpacker bubble of San Marcos & out in the Guatemalan countryside just witnessing people go about their day-to-day lives. It started to get pretty steep & pretty hot, pretty quickly. The happy chattering amongst us died off & turned more into hung over moans of “can we stop for more water?” or “how much further to the top? !” After around 2 hours of walking up hill we made it to the ridge that was to lead right over to the viewpoint we were aiming for. Everyone in the group was in very high spirits by this point, we had done the hard part & it seemed pretty plain sailing from here. The chatting amongst us had resumed, mainly about what we were going to eat for lunch when we had finished our hike, pretty standard hiking talk for Adam & I so we were delighted that we had found such like-minded friends! As with most viewpoints this one did not disappoint, the views of San Pedro & San Juan with the mighty Volcan San Pedro standing tall & posing perfectly for our photos were so impressive. We all gave each other a hug & enjoyed a break eating some of the snacks we’d purchased the day before, the homemade banana bread from one of the local women proving to be favourite. Once we had all the Instagram worthy shots we needed it was time to figure out how to get back down again. Armed with trusty old MAPS.ME we took the path that led up slightly in order to drop back down the other side of the mountain, to the village of Santa Clara where we were hoping to pick up some transport. Not long after we had set off from the viewpoint we came across 2 very cute little Guatemalan girls who were all smiles & “Hola” before running away from us shouting rapidly in honestly, we do not even know what language it was that fast. Strange we thought as we continued to walk. It was only a couple more minutes until we came to two very friendly adults, seemingly the parents of the cute girls who were all now sat in front of a small cave, a large sheet covering its entrance. We tried to walk past them but they very kindly & patiently told in Spanish (those lessons that we had taken in Cuba were paying off) that we could not pass the cave & we must go up the mountain a little more & get to Santa Clara that way. We looked up to where they were pointing to go which looked something of a steep rock climb & confirmed again, then again that we could not pass the path by the cave & we must go this way. They confirmed, with big smiles on their faces that we must as passing the cave was forbidden. Shoot! Rock climbing it was then! We are not going to lie, it was pretty hairy, one wrong slip from any of us & we were “gonners”. We took it very slowly for about 5 minutes to reach the path at the top, that 5 minutes though felt like 50 & we were so relieved to make it back onto the track unscathed. We all stood there to catch our breaths & then celebrated by sharing a packet of skittles and then onto the last part of our Indian Nose hike! The walk over to Santa Clara was stunning, more beautiful & untouched Guatemalan countryside & smiling farmers. We arrived at a church in the village just as they were finishing Sunday mass & were very happily greeted by a large group of the local community. There were smiles when they heard that we had walked over from San Pedro & various exchanges of names & where we were from. It was a refreshing change to speak with the locals without them trying to sell you anything, as with most tourist spots like San Pedro it can spoil the genuinity of people somewhat but so far Santa Clara seemed pretty untouched by tourism & its people were too. After some chatting we headed into the village to find food, we went into the a place with a smiling lady, the kind that has no menu & ordered 5 rounds of chicken as she was cooking that or pork that day. We were all so hungry at this point & devoured every last bit of the delicious hot meal, fried chicken, salad & rice all washed down with a refreshing Jamaica, a hibiscus flower drink that you must try if visiting this part of the world. 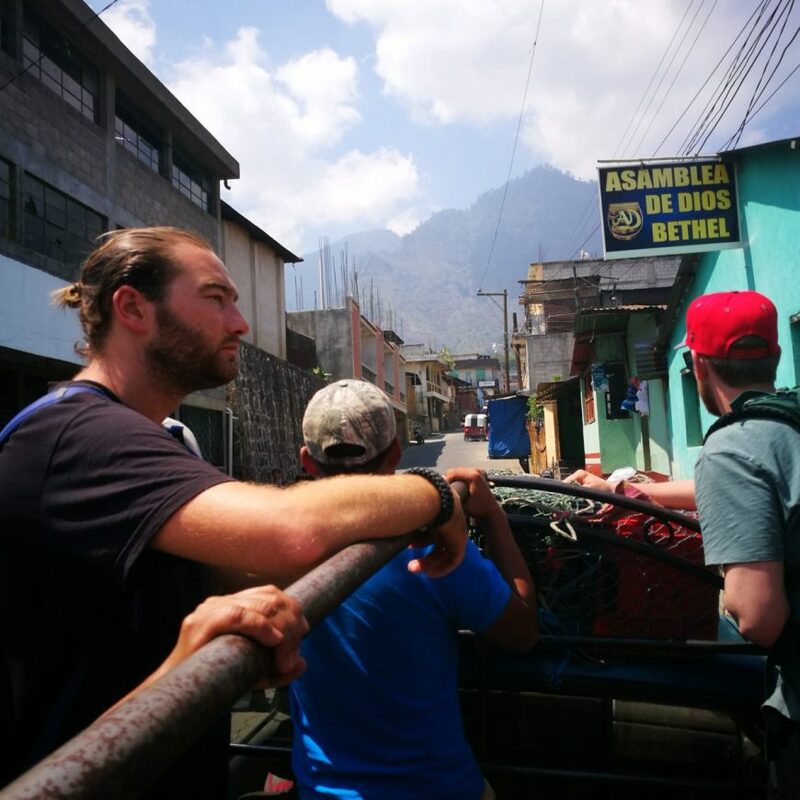 We paid up, with the bill coming to around 1/4 of what it would have done in San Pedro & started to search for some transport back to San Marcos La Laguna where we were planning to catch a boat over to San Pedro. We agreed with a pick up driver the price of 10 Q (Quetzale) per person to take us over to San Marcos, the journey was so much fun winding up & down the mountains stood up in the back of the truck. We had a short change to a tuk tuk with some debate over us paying some more but we had agreed the price of 10 Q per person so after a little discussion the driver decided to honour this agreement. In the village of San Marcos we hoped straight on a boat back over to San Pedro & welcomed the relief of sitting down after being on our feet all day. We all chatted about what an amazing day it had been, about the challenges of the hike, about how we would never know what was in that cave & about how good our very early lunch had tasted. We had formed an incredible bond with each other, one that comes from meeting complete strangers & just going to do really cool stuff together & that really is one of the things we love most about travelling. 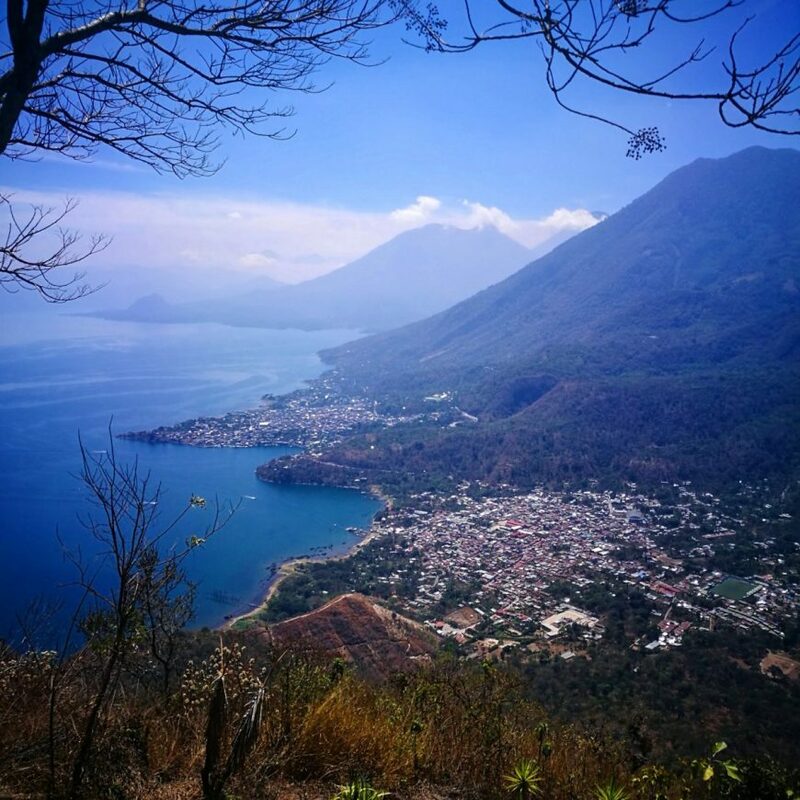 Whilst we say we did not find this hike dangerous in any way & found the locals very friendly there have been muggings reported on the trails around Lake Atitlan so take the necessary precautions for this. Do not carry too much cash with you or anything too valuable & try to hike in a group, we were a group of 1 girl & 4 guys which would certainly act as a deterrent for any opportunistic thieves. One of the big tourist things to do is to get up to this point for sunrise by taking a bus & walking a short distance to the viewpoint, we wanted things a little less crowded which is why we chose to set off at sunrise & take the route we did. Make sure you know which route you are taking though, the app MAPS.ME that we always use for navigating had all of the trails marked for this hike. Be prepared by wearing layers for it being hot or cold & to protect you from the sun, bring sunscreen & a cap & plenty of snacks & water with you. It takes around 4 hours to get to the village of Santa Clara from San Pedro with stops & with the steep incline taking a lot of energy snacks really are essential. Decent runners or hiking boots are also a must for the Indian Nose. Whilst we say don’t carry too much cash it is also not advisable to carry your ATM card with you (although you can use an ATM in the village of Santa Clara). Take enough cash to cover your basic costs so for us it was 5 Q for coffee, 15 Q for lunch, 10 Q for the pick up truck to San Marcos & 15 Q for the boat back to San Pedro, so a total of 45 Q per person in total. Be prepared to haggle on the transport costs & take a little extra for should you say run out of water or fancy an ice cream or beer or something. We hope you have enjoyed reading about our adventure. Do you have any questions? Have we missed anything? Tell us in the comments or tell us about any of your Lake Atitlan hiking or any other hiking experiences, we would love to hear. 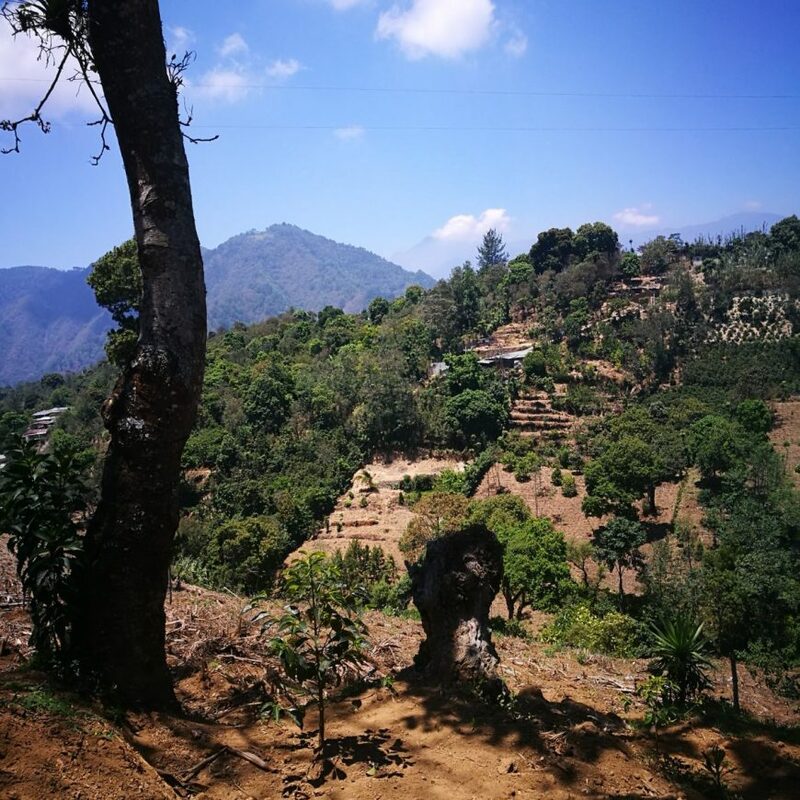 You can also read about the experience that travel couple Ron & Jess from Unearth The Voyage had whilst trekking in completely different location, Sapa, Vietnam right HERE. 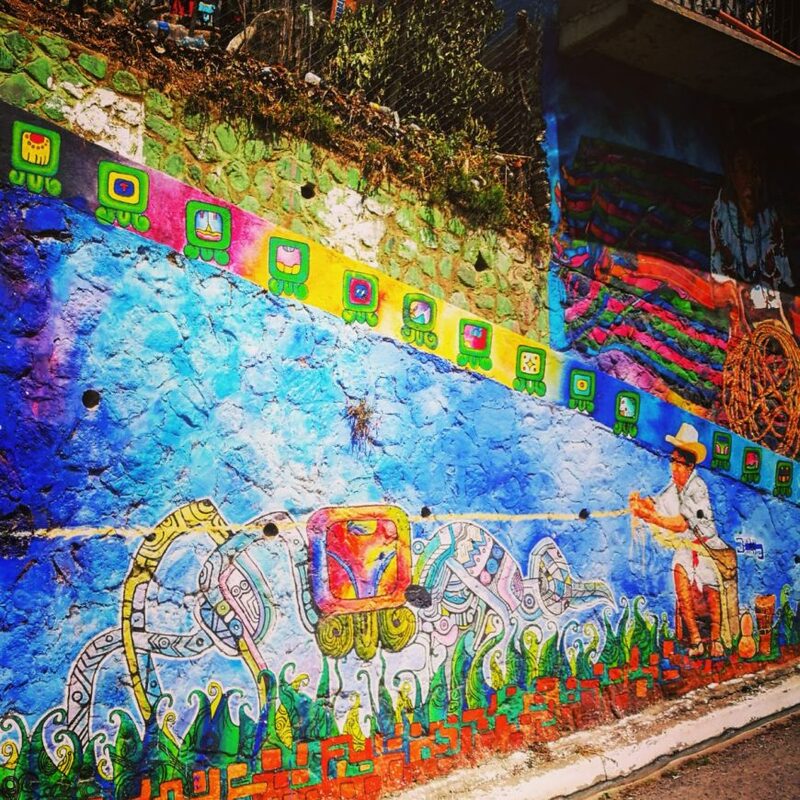 This entry was posted in Guatemala, Hiking. Bookmark the permalink. I would have had to know what is in the cave!! I wonder if they would have shown you! They didn’t look as though they were about to reveal, I guess we’ll never know!